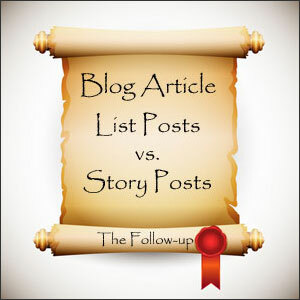 Did you weigh in your opinion on whether you like blog article list posts or story posts or both? Do you know what one of my favorite parts about this whole social media/blogging gig is? I am currently sitting outside in the warm sun. There is a fountain in the background and it really is a beautiful day. I love how you can work from anywhere. Today, I wanted to do a follow-up article on an article I wrote two weeks ago, Blogging: Do List Posts Really Get the Job Done? If you haven’t had the chance to read it, check it out. In that article, I wanted to spark a conversation and find out if you are using lists or story type posts or both types of articles in your blog posts. I feel like I am one of those really lucky people who have really amazing people reading my blog articles. One of my favorite things to do is to find out what you are thinking because I value your opinion. Over the last 2 weeks, over Facebook, Twitter, and on the blog article itself, you shared your opinion with me. Let me first say, thank you! I loved the responses. You are all so amazing. The responses were across the board. Some of you had no preference and you like both types of articles. Others were passionate about one or the other. A few felt that both types of articles were useful for certain content you want to communicate. Norma said it well, didn’t she? I have to agree with her. I think that list and story articles both have value, and I use either or both depending on the content. I love adding that personal touch with a story in every article I write. I really want my readers to feel as they know me. For me, that is best done through story. I am also very passionate about keeping blog articles easy-to-read. You’ve probably heard me say “Keep It Simple Stud”. List articles are a great way to do that, especially when I’m explaining something. Thank you again and I will see you back here next Tuesday. If you haven’t already subscribed to R & R Web Design LLC’s blog, make sure you do so that you don’t miss anything. What is your favorite part about working with social media and blogging?